This recipe for Grinch Crinkle Cookies will become part of your annual Christmas cookie baking tradition. With its easy to mix batter, your kids will love making these green crinkle cookies with the tiny red heart in the center…that’s two sizes too small. This cookie recipe is especially easy because it starts off with a box of cake mix, and you only have to measure out the wet ingredients. Not only can your kids make these cookies with a little help from you, but they can be a festive addition to any holiday party or cookie exchange. The ingredients for this cookie recipe are super simple. You’ll need a box of white cake mix (yellow could work too), 2 eggs, vegetable oil, green food coloring, powdered sugar, and of course…heart sprinkles. 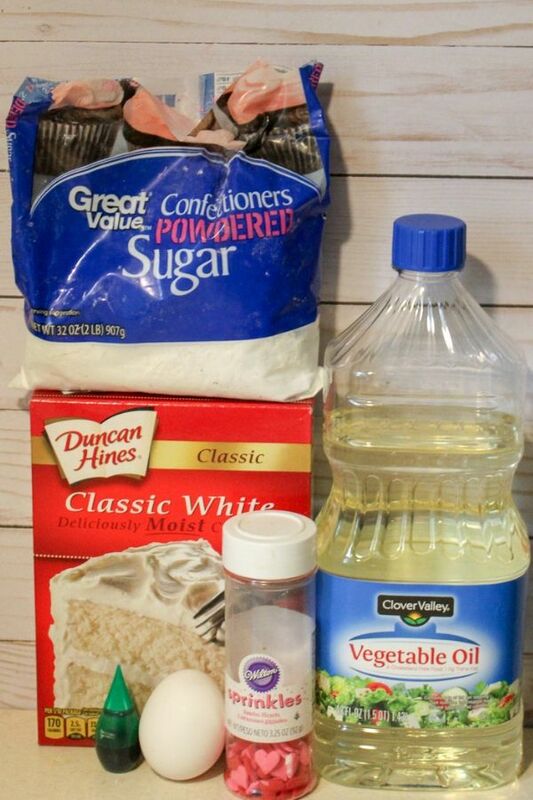 To make the cookie batter, just stir together the boxed cake mix with the oil and eggs, until they are thoroughly mixed. The batter will be thicker than you are used to with a boxed cake mix, as you do not add as much liquid. 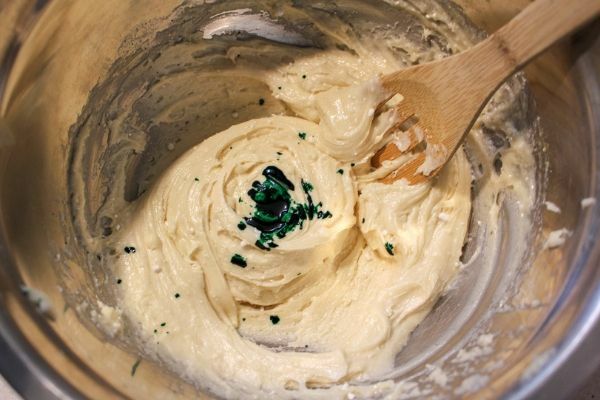 Next, add enough green food coloring to make the batter the perfect Grinch-y color. I would start off with just a couple drops, and then add one or two more at a time, mixing well after each addition, until you get the color you like. This is what my batter looked like after adding the coloring. It’s not too dark or too light, but about the color of the Grinch in the movie. Scoop out the dough into little balls, forming them into round shapes with your hands, and then drop them into some powdered sugar. Roll the balls around in the powdered sugar…it’s better to do this one or two at a time…until they are coated in the sugar. Place them on a parchment-covered cookie sheet, spaced a couple of inches apart. This is my favorite brand of parchment paper to use for baking. Right before you put these cookies in the oven, press one candy heart into each of the cookie balls…because you can’t forget the Grinch’s heart! Bake them for 8 to 10 minutes, and let them cool before eating. These easy to make Grinch Crinkle Cookies are perfect for your Christmas cookie tradition. This recipes uses a cake mix, which is great for kids that are just learning how to bake. Dr. Seuss himself would approve of these green cookies with the tiny red heart inside - a heart that is two sizes too small! Begin by preheating the oven to 375. In a bowl, combine cake mix, oil and eggs together. Mix in your green food coloring until you have the perfect Grinch color. In a second bowl pour 1 cup of powdered sugar. Gather a scoop of dough and roll in the powdered sugar mixture. Shape into a ball and place on a parchment lined cookie sheet. Add a heart sprinkle to each cookie. Aren’t they so much fun? Not only are they cute, but come together very quickly, and are pretty yummy too! Your Grinch Cookies are awesome! Hope you are having a good week and thanks so much for sharing with us at Full Plate Thursday! 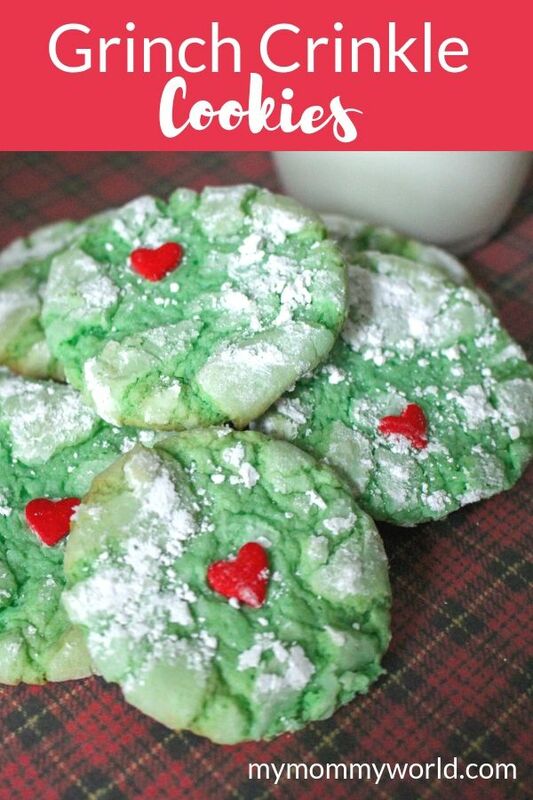 These Grinch cookies look like easy and delicious cookies to make. Perfect for a Christmas cookie plate. Hi Stayce…the recipe makes about 2 dozen, depending on how big you make the balls of dough.